I am sure I would have said this many times, to many people, in many situations, and yet I say it here again that – ‘Craziness is what defines me!’ And my travels, specially my road trips… Well they shed some good light on it. It was just last month that I had just returned from a trip with my colleagues to Rishikesh & Chakrata but I still could not find my peace of mind. It was getting hectic at work, I was not able to cope up with so much of commuting up and down everyday Delhi to Gurgaon. I was having few issues in family and with friends, parents were not too supportive towards my passion as well. Basically I was completely frustrated and was not able to focus at work as well. I needed a break, but that was ruled out as I had just come back from a trip 2 weeks ago. Well, people do go to Hyderabad for official work, but I was still not sure about this idea. However, the only thing I was certain about was that I really needed to meet her as I knew only she would be able to help me sort this tangled web of negative thoughts, and also I badly needed some time off from this frustration. I was not being fair to anyone leading this monotonous life, not to my work not to my family and most importantly not to my own self! Ohh! I have went on and on about my wanting to break the monotony. Let me clear a few things before I share further. Why Hyderabad? Well, my friend works in Hyderabad and I work in the NCR. And about the pact? Before she shifted to Hyderabad, we made a pact that I’ll come over there to visit her and we’ll go on a road trip to Goa or some other coastal destination. But it has to be a road trip! So, I think you can pretty much guess, I lied. I told my parents that there is a ‘Travel Conference’ in Hyderabad and me and my senior are going there to be a part of the conference. Of course they bought it, all they know about my work is that I work in a travel company and I might be a very good employee that is why I am getting this opportunity. Well, it certainly made them happy and my lie seem worth the effort as it brought smile on their faces and made my trip smooth. That’s how most of my trips are planned out. A random call from a friend, some new destination that had been on our to do list, last minute bookings, and Voila! We are travelling! I guess such travels bring the much missing excitement back to our lives. The same happened this time, I booked my flights for Hyderabad (Yeah! It’s provided by the company. I know that was a big lie.). We boarded a bus the same night from Hyderabad and next morning woke up in Chennai! It’s a wonderful city. Less crowded, less traffic (except office hours, of course), and delicious South Indian food. But no! That wasn’t our destination. 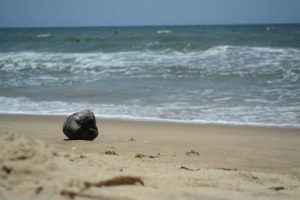 From Chennai, we hired an Activa and embarked on a road trip to Pondicherry via East Coast Road, and that I have to say was the major attraction of our journey. East Coast Road, or ECR, is one of the best roads in India you must drive onto. 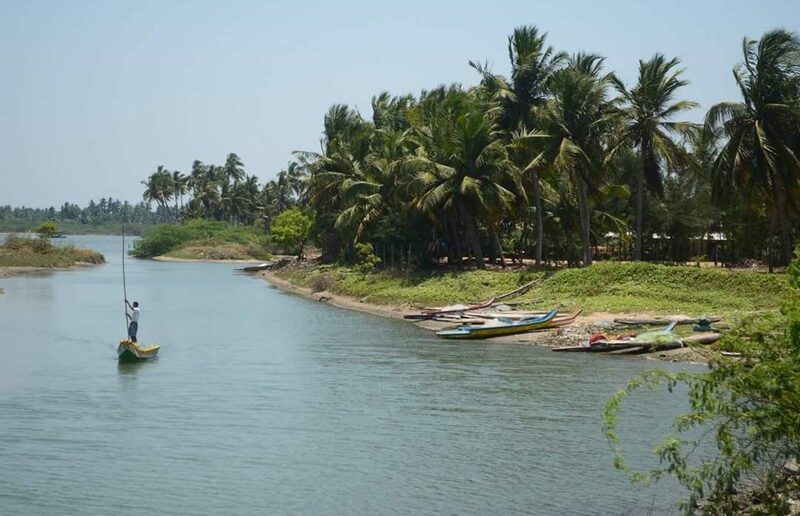 It runs along the Eastern coast, starting from Chennai to Kanyakumari via Pondicherry, crossing few rivers and lagoons and both sides of roads are lined with pine, coconut and banana trees. The 160km stretch of Chennai to Pondicherry was the best part of our trip. We didn’t stop anywhere, except to have some coconut, ice-creams, to take few photos along the coast, to soak our feet in the sand on beaches, and yeah that’s it! We didn’t stop anywhere at all! We were riding at 70kph and singing with our heart out all along the road. That was what I really needed. We took a small detour to Auroville as well. Auroville, city of dawn, is an experimental township in Viluppuram district of Tamil Nadu and was founded by Mirra Alfassa, The Mother, in 1968. It is named after Sri Aurobindo who was a philosopher, poet and a spiritual reformer. Auroville is a universal town where men and women of all countries are able to live in peace and progressive harmony, above all creeds, all politics and all nationalities. The purpose of Auroville is to realize human unity. As soon as you’ll enter Auroville, you’ll find people of different nationality, working together, governing together, and yes the best part – they don’t promote any religion, just spirituality. Roads to Auroville are very green and clean (which is very hard to find in Delhi or Hyderabad) and people are very generous. There is a huge golden sphere at the heart of Auroville, called MatriMandir – The Temple of The Mother. It is also called ‘Soul of The City’, as it signifies unity and spirituality, and the large open area in which it is situated is called ‘Peace’. We ran out of time to visit MatriMandir so we took our course back to Pondicherry, and that was the time when we got lost. To add to our luck, our phone was dead too. So we stepped back to the 20th century and used paper maps to find our way back, and trust me it’s more fun than Google maps. We reached Pondi in the evening and took a room in one of the hotels in the main market. Hotel rates are decent over there (varies from Rs. 600-900 per night for non-Ac), but if you’re looking for a room next to a beach, well get ready to burn a lot of money. We ate our dinner, Onion Dosa & Idli, with sambhar poured in a wine glass (couldn’t find any other), on the rock beach, and spend most of our evening there. We talked for hours about all the issues, life, work, and how insignificant we seem sitting next to this endless ocean. And then after a while…just silence! We were just staring at the horizon, enjoying the way waves were crashing on the rocks below us, and the cool breeze soothing our mind. I felt so connected to everything around me. No, I wasn’t drunk! It’s just that I found peace in that silence and tranquillity. I know I lied about the trip but if I hadn’t, I know I would have not had this amazing experience. As the clock struck 1:00 am, we went back to our hotel and slept like we were drugged! Next morning we gave a visit to Paradise beach, one of the best beaches in Pondi. 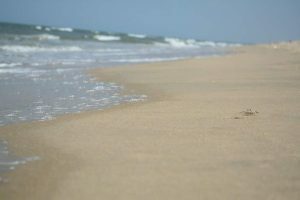 We spend most of our time just standing on the shore, immersing our feet in the sand with waves caressing our feet. Laughed with children of fishermen, dug out sea shells from the sand, and played cricket with kids on the beach. And of course, did our photography session with the locals. Indeed it was fun! Later, we headed back to our hotel, had lunch, packed our bags and were back on the ECR to Chennai and then all the way to Hyderabad. This road trip was completely different from the ones I’ve taken before. It was completely unplanned, started with a lie, and ended as one of the best times of my life. I felt a change in myself. Was it the company of my nomadic friend, the East Coast Road, beaches, or just the air there, I’m not sure. But it certainly was an experience that I am glad I had and I do not regret any of it, at all! Have you ever told a lie to go on a trip? I’m sure you have! Don’t hesitate, share your experiences via comments below.